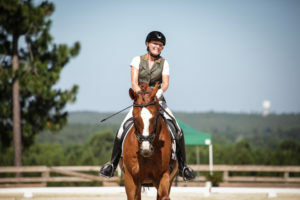 If you ended up on this site, you probably know someone with a disability or have issues of your own and are interested in learning about para-equestrian possibilities. I will be happy to talk with you about getting started at the grass roots level, as I did. There are lots of ways to ride as a para. There is special equipment to try, trainers that can help, symposiums for a crash course, and other para riders who can be truly supportive. One of the most difficult things as a para is the feeling that you are alone out there. At regular shows, you may be the only para, and that can feel intimidating. Below is my story about becoming Para Pam. Look closely at the tow-headed, straight-banged, 6 year old girl in the black and white photo. She almost faces the camera giving a small, self-conscious smile that you attribute to her missing front tooth. That would be normal. But she always smiles like that. If you thumb through other pictures, you notice that she sits a certain way, holds her hands a certain way. You would never guess that she was born with disabilities because, already, at such a young age, she has figured out ways to hide. For decades, I did everything in my power to hide who I really am. I walk differently, I stand differently. I still pose for pictures differently so as to hide myself from you. When you look at me, you won’t notice right away. So, I am coming out – here – today. I am disabled. I was going to say that I am a para-equestrian but that isn’t the total truth. I am disabled. I am not differently abled. I can’t fly. I can do lots of things that you can do. There are just things that I cannot do that you do with ease. I have a reoccurring dream of reaching for a casserole dish from my top kitchen cabinet with both of my hands. I can feel the dish in my hand, the heft of the pyrex, the cool touch of the lid. I wake feeling strong because I retrieved the casserole dish without help. Doing things without aide is incredibly empowering to me. That is how riding makes me feel. Like I am dreaming and I am strong. 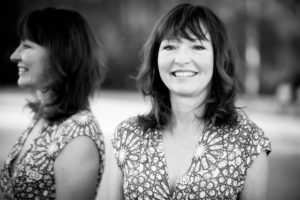 Birth defects didn’t keep this little girl (now a middle aged woman) from wanting the same dream as so many other young girls. 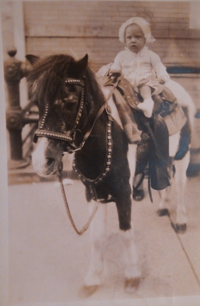 I bought my first horse at 36 years old, after my third child was born. 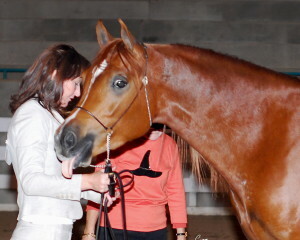 I have ridden in Hunter Pleasure, western, Country English, and Native Arabian Costume classes at Arabian shows. The problems were many. I didn’t know when I was on the correct lead, I dropped my reins as often as I held them through a class, and I struggled. I struggled. But I never told anyone that I wasn’t really failing, I was actually winning. Every 8th or 5th place ribbon meant that I was reaching that casserole dish. Were there times when that dish scattered into a million pieces? Absolutely. Did my heart ache? Sometimes. So what instigated my coming out? Dressage. 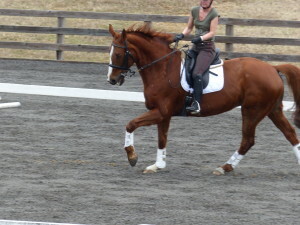 I never did dressage because I never truly had a dressage horse. Then I bought GM Major Soho, aka Wrigley. I thought that I was buying a young, hunter pleasure horse to replace an aging main ring Arabian. I bought him because he was incredibly beautiful and, at three years old, looked like he would move well. 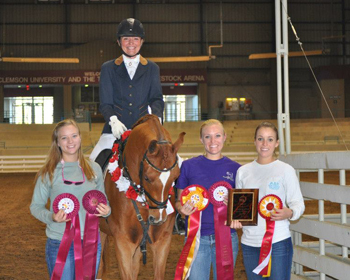 We won lots of Halter classes and Championships while doing groundwork to prepare for saddle work. I knew that I wasn’t horsewoman enough to train this purebred Arabian by myself, so I called in the expert, Melanie Mitchell. 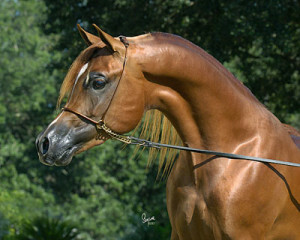 Melanie took one look at said, “He is a freak of nature – an Arabian who moves like a Warm Blood. He must do dressage!” I said, “But, I don’t do dressage.” She said, “You will.” As in most things horsey, she was right. 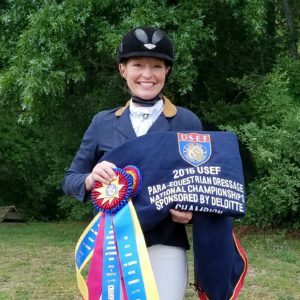 What I found with dressage, though, was that it took more skills than I had and that I couldn’t just go for a ride, I had to ride. Really ride, and for that, I needed Melanie and my Dispensation. The problem with a Dispensation is that you can’t hide your disability, you are out there. I hear the comments as I warm up around the ring. “What’s wrong with her? She looks fine to me. Why does she get to use special equipment?” The first time that I rode in a show using my special equipment, I sat on my horse and cried. This wasn’t something I chose, I was born with Erb’s Palsy, cerebral palsy, and neurological issues in my lower legs due to a traumatic brain injury during a violent birth. What you can see, if you look closely, is that my left arm is almost 6 inches shorter. I can’t lift it and I can’t straighten it. I have little feeling in it. Then there are my other disabilities that are harder to see because I have learned to hide them so well. Disabled. Impaired. Birth defect. Those words have such power. They can strip you of your confidence. Handicapped is, perhaps, the closest to what I am when I use my Dispensation allowing my special equipment and special rules. Para-equestrian. 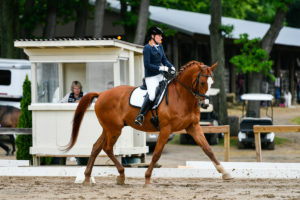 Dressage rider. Elite Athlete. These words are powerful, also. I have as much drive as any other elite athlete striving for a goal. Maybe more. I train 6 days a week, depending on weather and the shape of the footing in the ring. I watch training videos on any day that I can’t ride. I film myself and watch them like football players after a big game. I am committed to being the best I can be and I’m putting in the work, time, and money to make that a reality. Don’t get me wrong, I’m competitive. Very. I’ve just learned that to be competitive, I had to level the playing field; I had to have a little help. Feel free to talk to me at shows. Ask me what you will. I will hide no longer. I will look you in the eye and answer anything. What it has taken me all these years to figure out is this: These disabilities helped make me who I am and I am proud of that woman. I luckily had the support of uncles who taught me to swim and camp, of aunts who taught me to cook so that I could teach my own children, of sisters and cousins who treated me with all the meanness and love with which they treated each other, of a mother that ensured that my physical therapy never stopped even though she had to work multiple jobs. Because my arm looked truly deformed until surgery at age 7, I learned to entertain myself by becoming a voracious reader. I was alone a lot, so I learned to be self-sufficient in most things and bull-headed in others. Yes, I have physical shortfalls. 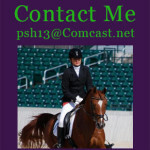 I’m also a dressage rider and I get better day by day. Look for me in the warm-up arena. I’m usually the one with the biggest smile and the happiest laugh because I’m doing exactly what I always dreamed that I could.